I�EUR(TM)ve tried twice now to make Daal Makhani in my slow cooker. The first time was an utter disaster. I�EUR(TM)ll call the second time an �EURoeorchestrated�EUR� success. After slow cooking the daal for 8 hours, it was still a little tough. We were tired of waiting and ready to eat it with our palak channa, so I cheated. I emptied the contents of the slow cooker bowl directly into the pressure cooker and let it cook for 10 minutes. The result was creamy, soft masala spiked daal, but I can�EUR(TM)t in good conscience pass it off as 100% slow cooked Daal Makhani. Sometimes, cheating is okay. 70�EUR(TM)s housewives were on to something good with slow cookers. With a little pre-planning, you throw everything into the slow cooker, let the slow cooker do all of the work and a few hours later emerges a dish that has that �EURoeslaved-over-the-stove�EUR� look. Genius. This brings me to the first reason why I�EUR(TM)ve been mildly obsessive over trying to make Daal Makhani in my slow cooker (it’s a 3-in-1 Rice Cooker, Slow Cooker and Steamer ). The second reason is that I read somewhere that Tamarind Bay in Harvard Square has such decadent Daal Makhani because they let it cook overnight in the tandoor and use loads of ghee. We don’t have a tandoor and I refuse to use ghee, so successfully slow cooking the Daal Makhani is the closest I can come to having that at home. If you make slow cooker Daal Makhani and are more in sync with your slow cooker, I would love to hear your tips in the comments. *These ingredients will not be added until the slow cooking is complete. The first time I attempted this is in my slow cooker, I made two mistakes – First, I didn�EUR(TM)t soak the urad daal overnight because when I use my pressure cooker only, that�EUR(TM)s not required. Whole urad daal, however, has a tough husk, so you should soak it overnight when slow cooking. Second, I added the tomatoes and salt to the slow cooker bowl at the beginning of the 8 hours. After reading Robin Robertson�EUR(TM)s Fresh From the Vegetarian Slow Cooker, I learned that high acidity ingredients (like tomatoes and salt) should not be added until the very end because otherwise the lentils remain tough. 1. Turn the slow cooker on. If you�EUR(TM)re slow cooker has High-Medium-Low settings, I recommend high. Heat about 1 tbsp. oil in the slow cooker bowl. 2. Soak whole urad daal overnight. Drain the excess water and sift through it for any stones or other debris. Open a can of kidney beans, drain the canned water and rinse in a colander in cold water. 3. Cook the onions in the slow cooker bowl with the lid open until translucent. Add the ginger-garlic paste and chilis and cook for 2-3 minutes. 4. Add all of the masalas EXCEPT for the salt. Mix in well. 5. Add the urad daal and kidney beans to the slow cooker bowl along with 3 cups water. Close the lid and set to cook for 8 hours. Robin offers another tip for successful slow cooking – don�EUR(TM)t lift the lid to peek. We broke this rule approximately 3 times. Over an 8 hour period, who can resist?! 7. Close to the 8th hour, saute the diced tomatoes in a hot saucepan on medium-high heat with just a little oil (1/4 tspn) until they melt. Turn the heat to low and whisk in the yogurt and milk. Remove from heat. 8. When the slow cooker signals it�EUR(TM)s complete, stir the tomato mixture in and add salt to taste. If your lentils still feel a little undercooked, don�EUR(TM)t be embarrassed to do what I did. Dump them into the pressure cooker for 10 minutes or 1 whistle. 9. Garnish with fresh, chopped cilantro. The fact that I had to use my Fagor pressure cooker after all those hours of slow cooking (albeit effortless hours on my part) has left me with some deeply philosophical questions about whether there was any real value in slow cooking the Daal Makhani. Rajat’s verdict is that while the Daal Makhani was tasty, the 8 hours wasn�EUR(TM)t necessary and if I just stuck to the pressure cooker, it would have been as good. I can�EUR(TM)t help but feel like the daal got a richer, heartier flavor over the course of the 8 hours. Also, my pressure cooker daal is usually far too dry, whereas in the slow cooker, less liquid evaporates leaving more of the masala spiked, creamy liquid (delicious for dipping naan in). Perhaps most importantly, it�EUR(TM)s not as though we actually expended any effort apart from resisting urges to lift the slow cooker lid during the 8 hours – so there’s nothing lost. I would love some slow cooking tips because until then, I�EUR(TM)m sticking with the 99.98% slow cooker method since it did hands down lead to the best Daal Makhani I�EUR(TM)ve ever made. Update: Maybe a daal without as tough of a husk would fare better in the slow cooker without a need to pre or post pressure cook. I’m thinking about maybe trying Masoor Daal or even Toor or Chana Daal…any thoughts? Pressure cooking is what worked for me too, but I did that before I put it in the slow cooker. I had the daals soaked, pressure cooked, I did the tadka and then I kept in the cooker for the whole day. The taste was amazing….and instead of yogurt, I used evaporated milk…I love its flavor. Trupti, okay on your word, I will try it again but this time backwards – pressure cooking then slow cooking. Evaporated milk is an interesting idea too…Thanks! Girl, you got loads of patience. Usha, thanks for the compliments! The daal, despite requiring a little finnagling between the slow cooker and pressure cooker was delicious. It can definitely be repeated using just a pressure cooker. Looking forward to reading your blog too. Chuck, I’m definitely going to try vegetarian chili in the slow cooker…I bet the soy protein would taste great after being slow cooked for hours. Yum. Secondly, cheating or not, I say good on you for using the pressure cooker. What matters is the end result, right? SuperChef, I hope you try it – I haven’t quite ventured in making sabji’s in the slow cooker but it would be interesting. Glad to have found your blog! I have cooked dal makhni twice in the slowcooker and both times i did not presoak or pressure cook after.I dumped the dal,the onions,ginger garlic paste,all masalas at the same time and got perfectly good dal.The only mistake I made the first time was to have started it at around 9 in the night in anticipation of having it ready for lunch.I did not realise that the house would smell of dal amd masala all night long.Believe me when I say that i could not sleep all night because of the smell!My daughter was awakened by the smell and thought why would i be making bean burritos at 5 in the morning ! (I am deliberately using the word ‘smell’ and not aroma because the last thing on your mind is aroma when you want to sleep! !my husband even suggested that i plug the cooker in the garage or basement or even the tightly shut bathroom,but not the kitcken when i next had the urge to start the dal at night!) So the next time,i started it at around 8 in the morning and we had good dal ready in about 8 to 10 hours.I cook it on low initially and than on high for the last couple of hours.I add the tomatoes and cream/milk at the end -after the dal has cooked.I end with a tadka -which is entirely optional and would not miss it if not done. @Anu, that is a really funny story about the yummy smells in the midde of the night. I would have a hard time sleeping too. What do you include in your tadka? Also, is your slowcooker just a slow cooker? Mine is a 3-in-1, which I love for making rice but am thinking is maybe not a great slowcooker. For example, I don’t think it has an option btw high and low. Thanks! i have a dedicated crockpot-slow cooker and tried making Tuvar dal. after 6 hours of waiting, i had to go with my pressure cooker. i did add an extra cup of water, as one blog suggested to add 1 extra cup of water. I would love to hear how it turns out…slow cooked daal is so flavorful. Love the idea of slow cooker Indian!! I just discovered Anupy Singlaâ€™s â€œThe Indian Slow Cookerâ€ book which is mostly vegan or easily vegan adaptable and they are SIMPLE! She uses dried beans, unsoaked and most of the recipes you dump everything in at once and push the button. A couple have you cook the mustard seeds, etcâ€¦on the stove at the end but SO EASY!! But you might LOVE this book!! I stumbled upon it upon accident because I only look in the vegan book sections. So being born and raised in the USA, and married to a Punjabi guy who loves his Indian food, I have really fallen in love with my slow cooker. I work full time and have a 3yr old, so I am busy. I cook typical Punjabi/Desi food about 4 nights a week. 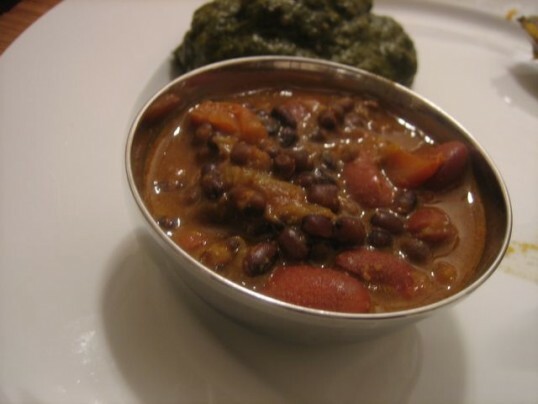 I make any Dal, Sholay, and Rajma in the slow cooker. I don’t follow a specific recipe but here’s an idea of what I do: Rinse and place dal/rajma/sholay in slow cooker, add hot water,turn on high. Then I saute the Thardka (toss together: Olive Oil, chopped onion, garlic, ginger, jalepeno, cilantro, tomato, salt, pepper, cumin, and dried coriander) Saute until the ingredients are blended together like a paste. Then pour this into the slow cooker, change heat to low and head to work. Dinners done! You can add other ingredients to the paste, but this one has a light and fresh taste with not too many masala’s and spices. One last tip if you cook Indian dishes frequently: about once a month, I will use an electric chopper to chop and freeze onion, garlic, ginger, jalapeno, tomato, and cilantro. This makes cooking any dish a breeze, as these ingredients are in most Indian dishes. Hi Jeeven, these are great tips! Thanks for sharing. I love the idea of freezing the commonly used ingredients. It’s a great way to make sure that the ingredients like pepper and cilantro get used before going bad too. Do you use dried rajma and chickpeas?